With the special screening of ART4SPACE (covered) for Invader's fans in New York City last month, you would expect the secretive street artist to also make an appearance. 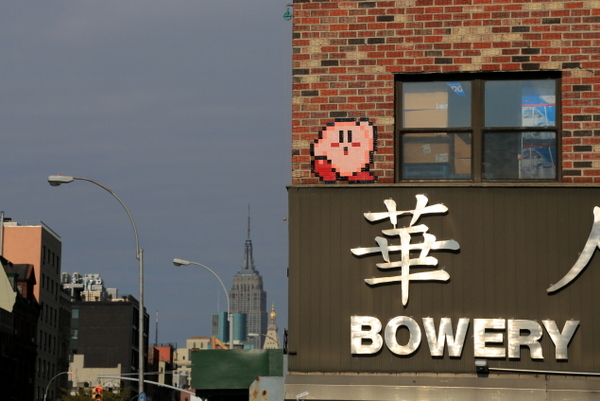 As evidenced by the fresh public works, including the appearance of new video game characters and other pop icons, Invader made the most of his time while in the Big Apple. In addition to a collaboration (seen below) with the legendary NY graffiti artist COST and partner ENX, Invader also had a run-in with the NYPD. Take a look at more photos below... Photo credit: Luna Park. Discuss Invader here.